In 1635, a ship named Elizabeth arrived at the Charlestown dock in Boston, MA. It was carrying a twenty-two year old man named John Clough. Several previous Clough Societies had been organized-each making a contribution to the genealogical work of the Clough family. However, in 1939, Walter Cluff and a group of amateur genealogists (including Mrs. Franklin Rogers, Percy Cluff, Hilda Clough Lincoln, Samuel Clough and others) gathered in Exeter, NH and organized The John Clough Genealogical Society (JCGS). In 1952 (with a second printing in 1988), the Society published “The Genealogy of the Descendants of John Clough of Salisbury, MA” covering the first seven generations. Volume II, covering the eighth through tenth generations, was published in 1966. In 2009, the Society published a two-volume Genealogy revision with corrections and additions collected since the 1960’s. All four volumes are available in the Clough Store and would make a handsome addition to your library that will be treasured for generations to come. The family reunion is an annual highlight for many who travel far to attend. By developing relationships and friendships, we hope to better understand our family history and meet our cousins in an environment that embraces the family pride envisioned so many years ago. John Clough Memorial- "In memory of John Clough 1613 - 1691 and his wife Jane. John Clough emigrated from England in 1635. He was a proprietor of Salisbury in 1639 and built a home in the settlement. About 1656, he became a pioneer on Salisbury Plains where he purchased a farm of several hundred acres, in this vicinity. For many years he was a prudential man, and held other offices of honor and trust in the town. 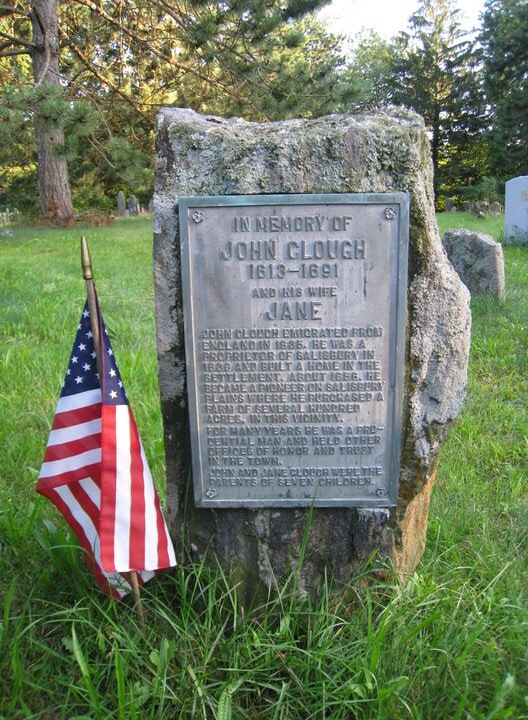 John and Jane Clough were the parents of seven children."